This article was inspired by graffiti. On 7 October Barack Obama welcomed Beji Caid el Sebsi, interim Tunisian Prime Minister, in the Oval Office. During the meeting Obama commented, “The United States has enormous stake in seeing success in Tunisia and the creation of greater opportunity and more business investment in Tunisia.” This focused language on US economic regional involvement echoes recent comments by John McCain who on a visit to Libya at the end of September noted that American investors are eager to invest and do business in Libya. This kind of discourse inevitably produces a cringe from anyone familiar with American neoliberal economic foreign policies. But the meeting between Obama and Sebsi was about more than just economic cooperation. Obama also took the opportunity to hail Tunisia’s progress toward democracy and praise the country as the “inspiration” of the Arab Spring. Afterwards the Office of the Press Secretary of the White House released The President’s Framework for Investing in Tunisia. The document outlines a myriad of non-security assistance including investments in private sector development; education, culture, and media capacity building; transitional justice; and democracy and civil society. In line with the final two themes Obama commented during the meeting that “Tunisia has been an inspiration to all of us who believe that each individual, man and woman, has certain inalienable rights.” Obama’s vocabulary elicits the language of the Universal Declaration on Human Rights. Furthermore, the White House praised Tunisia for increasing transparency in governance. The high level meeting has symbolic force in a number of analyzable trajectories. Namely, by meeting with Sebsi the White House is certifying Sebsi as the referent object of state-based transactions with not only the interim government but the social and political transformations taking place in Tunisia. Certification, explains sociologists Charles Tilly and Sidney Tarrow, is an external authority’s signal of its readiness to recognize and support the existence and claims of a political actor (Tilly and Tarrow, 2007: 215). Certification is important for both domestic and international actors and can have distinct and lasting signification for the evolution of discourse on a given phenomenon, in this case the meaning of Sebsi as a signifier of two distinct signified concepts. The signification Obama addresses is the legitimate representative of Tunisia to the White House, the Prime Minister of Tunisia. It is that of a bounded political person. The second signification of Sebsi is the social and political significance he has for the people of Tunisia themselves, of course further dissected with the myriad identities and interests of the Tunisian population. As with other names and symbols, Beji Caid el Sebsi is an abstract assortment of letters that are only given meaning when placed in relationship to other symbols within a given social space. I believe it is important to examine this because it allows us to analyze the language and symbols at work in the evolving reality and political meaning of the current social space under discussion. When Obama says that Tunisia has been an inspiration to those who believe in inalienable rights, while meeting with the interim political representative of Tunisia, the certification broadcast from the White House is that Sebsi is, in terms of the symbolism of international parlance, the Tunisia being praised. For example we often speak of the Obama White House, the Ben Ali years, the Tony Blair UK, etc. A given country is generally referred to based on the political entity at its helm. Again, the White House is certifying Sebsi as the deserving recipient of praise. We should examine Sebsi in this light. In a recent New York Times article David Kirkpatrick asks the interim Prime Minister to explain his go-slow approach to addressing popular demands for jobs and political freedoms. The response: “When someone is hungry asking for food, you only give him what he needs. You don’t give him more, or else he might die, so we offer a step-by-step approach.” He continued: “Sometimes the proponents of freedom have demands that go beyond logic and it is more difficult to protect freedom from the proponents of freedom themselves than from the enemies.” Still, his approach has, according to Kirkpatrick, lead to broad support generally but also a number of comparisons with Zine el-Abidine Ben Ali. As a former member of Ben Ali’s party, and a long time political figure Sebsi’s position has enraged those who demand a complete rift with the past. The 84 year old Beji Caid el Sebsi studied law in Paris before returning to pass the bar in Tunis in 1952. He was an early member of Habib Bourguiba’s administration following Tunisia’s independence in 1956. For the next two decades he served in numerous positions including as Defense Minister and ambassador to France from 1970 until 1972. In 1971 and 1972 he is reported to have advocated for greater democracy in Tunisia. In an article he submitted to Le Monde before leaving Paris in January 1972, he attributed his resignation to frustrations over continued democratic deficiencies. He resumed politics in 1981, serving as Minister of Foreign Affairs until 1986. Until 1994, when he apparently retired from politics, he served a number of other key roles within the Constitutional Democratic Party, Rassemblement Constitutionel Démocratique (RCD), Ben Ali’s party. On 27 February Sebsi took over the mantle of interim Prime Minister from Mohamed Ghannouchi who was forced from this position by popular protests to route out all former members of the Ben Ali regime. It is fascinating to observe that the Beji Caid el Sebsi Facebook page description of his political career ends in 1986, one year before Ben Ali’s Jasmine Revolution swept Habib Bourguiba from power. Of course public figure pages, fan pages and the like are not necessarily affiliated with the individuals themselves but that the designers of the facebook page decided to conclude Sebsi’s political career before the former dictator’s coup is indicative of a trend to distance Sebsi from the ancien regime despite a clear history of eight years of involvement. This distancing is a logical political strategy, considering it was anger over Ghannouchi’s affiliation with the former regime that forced him from office a month after Ben Ali. That Sebsi has remained could be analyzed from a number of perspectives, of which there is not enough room to develop all of here. 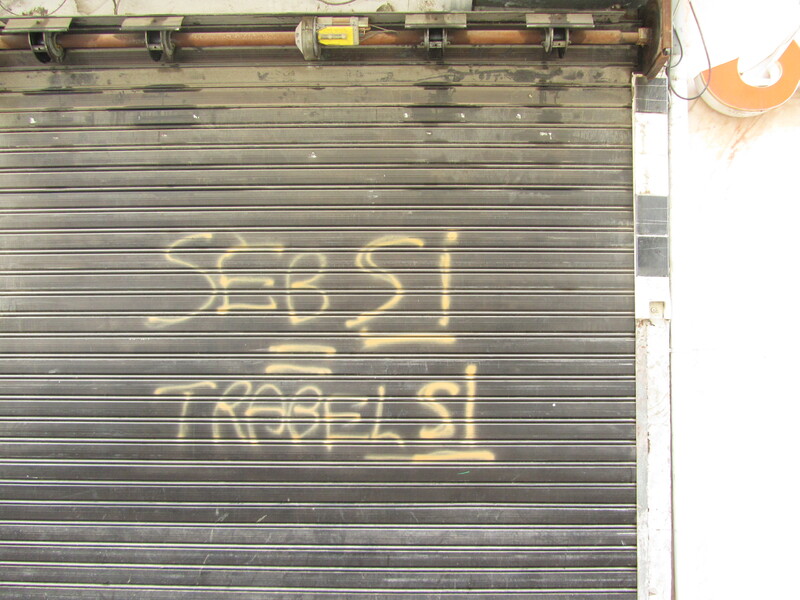 Whether Sebsi should be interpreted in relationship to the former RCD party and Ben Ali himself or as a reform minded, advocate of democratic rights, or any other interpretation should be left to the people of Tunisia. But I will present two partial treatments of Beji Caid el Sebsi as a symbol for further discussion. First I will examine Sebsi, as the source of the analogous treatment of spoon feeding the hungry (see quote above) in relation to achieving democracy and human rights. Human rights are universal. The preamble of the International Covenant on Economic, Social, and Cultural Rights (ICESCR) states that they are derived from the inherent dignity of the human person. They do not originate from the capriciousness of sovereign largess. Article 3 of the ICESCR and the International Covenant on Civil and Political Rights (ICCPR) both state that the States Parties to the covenants undertake to ensure the equal rights of men and women to the enjoyment of all economic, social and cultural rights, and all civil and political rights set forth in the Covenants. Furthermore, article 50 of the ICCPR and article 28 of the ICESCR reads, “The provisions of the present Covenant shall extend to all parts of federal States without any limitations or exceptions.” Tunisia has both signed and ratified these international human rights treaties and is held legally responsible for them. They are clear in their wording, and there is no mention of sparing the human being by not extending too many human rights at one time when they are not accustomed to being afforded them due to years of oppression. It is unarguable that within certain state structures these treaties receive varying degrees of compliance. It is furthermore clear that the transition from an oppressive, human rights abusing, dictatorship to a free democratic state that respects the human rights of all its citizens is an arduous task. But the sort of language that Sebsi is employing creates an institutionalized vocabulary for accepting protracted human rights violations masked with the intention of protecting those very people who are being oppressed. Furthermore, when this rhetoric is certified by powerful foreign governments, such as when Obama praises Sebsi for the developments of democracy and freedom, it creates the potential for the entrenchment of this sort of vocabulary, which translates into material social reality. It provides a symbolic force and precedent for a possible “Sebsiism,” or some other such political strategy. In a situation where many are apathetic or distrustful of politics, the potential of established elites seizing control of the discourse is high. This is among the worst results as it runs the greatest risk of leading to protracted social unrest and anger over the failure to follow through on the hopes of establishing an open and democratic country. In the hopes of engaging with a diversity of narratives I will conclude with a treatment of an alternative interpretation of Sebsi than the one that has received White House certification. An interpretation that is being positioned within the battleground of public space. 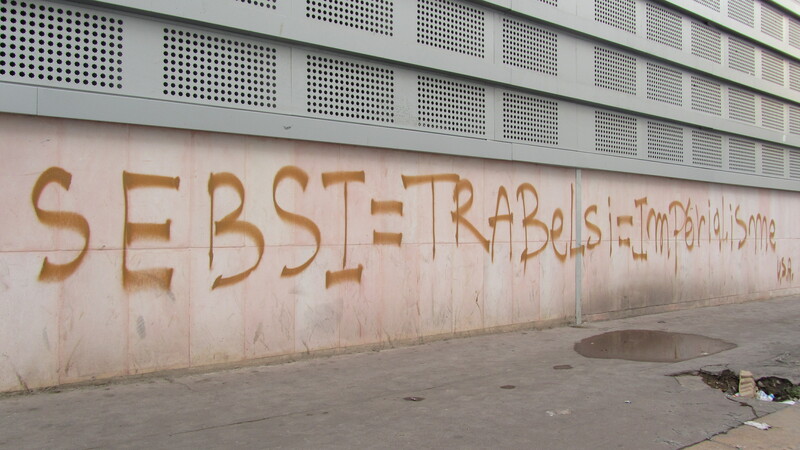 These pieces of graffiti construct a parallel between Beji Caid el Sebsi and Leila (Ben Ali) Trabelsi, the wife of the ousted dictator who in many circles is more despised than Ben Ali himself. She has been compared to Imelda Marcos, the extravagant wife of former Philippines dictator Ferdinand Marcos. 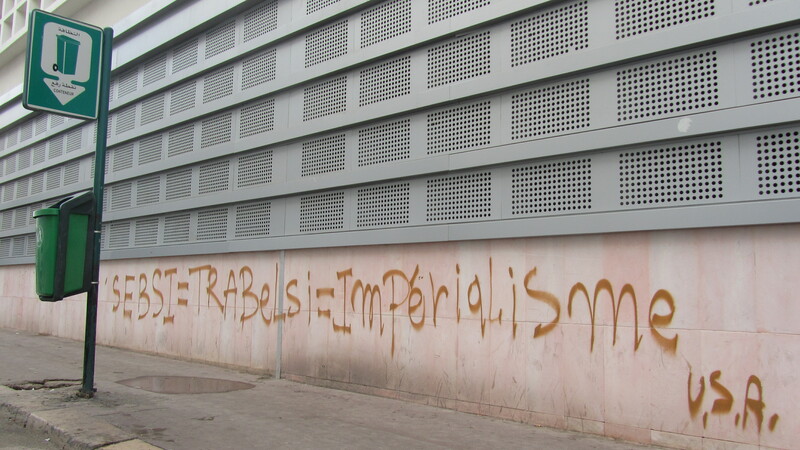 Trabelsi is a symbol of corruption, nepotism, abuse, and oppression that received certification through the Western dominated double standards of shallow political and economic security, known in other contexts as imperialism (as the graffiti above notes). The parallel signification is potent artistic activism. Political philosopher Chantal Mouffe encourages us to understand the political character of certain varieties of artistic activism as part of counter-hegemonic interventions with the objective to occupy the public space and disrupt the dominant (Mouffe, 2007). For Mouffe’s Radical Democratic Theory, the political is the public space, the public sphere of discourse. When individuals feel that political lines are blurred or that their participation is meaningless, alienation and disenchantment occur. When individuals are disaffected with political parties, or feel alienated from traditional forms of political participation they often turn to more exclusionist forms of collective identity such as forms of nationalism, religious fundamentalism or other comprehensive exclusionary identities that only foster antagonistic conceptions of friend/enemy, ‘us’ ‘them’ and perpetuate violent conflict. Radical democratic theory holds that the more empowered and involved individuals are in the institutions and programs that directly affect their lives the more they become civic spirited and connected to the polity: belief in the viability of discourse severely limits violence as a bargaining tool. Mouffe’s theory can be partially summarized as, when consensus is sought through public deliberation, by embracing the inherent conflicts of social life individuals become more public spirited, tolerant and knowledgeable of the values of others and often more analytical of their own values and motives. In this sense we can interpret acts of artistic activism as part of a process of opening up a radical space for democratic participation where previously there was none. It affords the agent with a degree of power to engage in counter-discourse formation through inscriptions in the public space. But it must be given an equal chance to contribute to the evolving vocabulary by which social and political transformations are scripted. This artistic activism is part of the process of interpreting a meaning for Beji Caid el Sebsi within not only the domestic social space of Tunisia but also the evolving international narrative on Tunisia. Two related articles, the first one has fantastic images. A tumultuous year, told through the scrawls and murals of the people living through it. Graffiti is as American as apple pie, but much easier to export. My hat is off to your astute command over this top-oibravc!